Your glowing face is the index of healthy skin . If you have a sensitive skin that reacts to chemical compositions in the cosmetics that you use regularly , you may develop some dark spots on your face as a side effect . They might be looking invincible but can erased with natural bleaching facial packs which are pure and healthy (cosmetic free ) , they not only make the dark spots to fade away but also in time makes your facial skin glow with healthy radiance . Healthy skin has a glow and bounce too . Let's check out some of the facial packs that suits to all types of skins including sensitive , which you can try and check out the results for yourself . In order to make your skin healthy this process may take some time to rejuvenate your natural radiance , but the wait is worthy . Orange Peel Powder , refer to the post by clicking the link. 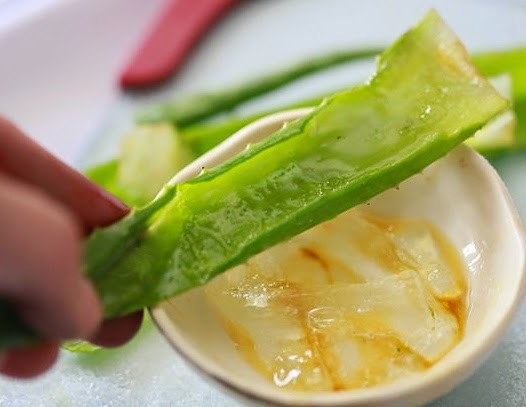 Aloe Vera gel can also be applied to the face to get a soothing effect . This even helps to lighten the tone of your skin and promotes spot free face with smooth and bouncy texture . Apply aloe vera gel on your face and gently massage with your fingers in circular patterns for even application and absorption , leave it for 10 minutes and then wash it off with cold water and gently dab with a smooth towel . Mash a ripe tomato and pass it through a sieve to strain out the seeds. Add some curd to it and mix well. Apply the pack on your face evenly and then leave it to dry. Then wash it off with lukewarm water and pat your skin dry. Tomato is acidic in nature loaded with tons of vitamin C in it. It will help to fade off the marks on regular use. Grate a potato after peeling its skin. Now add some rose water to it and beat it to make a paste. You can add some drops of lemon juice or honey if you have oily or dry skin respectively. Apply it on your face for at least 15 minutes and then wash away with water. Potato has mild bleaching properties and regular use of this paste will reduce spots and lighten your skin. Peel a cucumber and then grate it. Now squeeze it to take out its juice. Mix some aloevera gel in it and then apply this pack on your face. Literally a cooling pack, this helps soothe the skin and also lighten it. Lemon is also one of the best natural bleaching agents and you can skin results after the first use itself. You can squeeze a lemon and apply its juice directly on the skin or even add other natural ingredients such as glycerine or honey or curd to make it slightly less acidic. Use these packs weekly once to see results. Make sure you avoid the area around the eyes and do not go out in direct sunlight after applying these packs. Follow it up with a good moisturising sunscreen to protect your skin. Go for organic produce to avoid any residues of pesticides which might hinder your skin. If you cannot get any organic produce , you can wash and rinse the veggies or fruits with cold and luke warm water to wash away the residues .